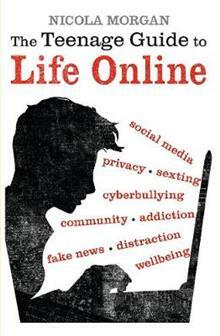 The authoritative guide to the online world by the award-winning author of Blame My Brain, The Teenage Guide to Stress and The Teenage Guide to Friends.From the award-winning author of Blame My Brain, The Teenage Guide to Stress and The Teenage Guide to Friends comes The Teenage ... read full description below. The authoritative guide to life online by the well-known author of The Teenage Guide to Stress and Blame Your Brain.From the award-winning author of The Teenage Guide to Stress comes The Teenage Guide to Life Online, a balanced look at what happens to us all - young and old - when we spend time on the internet. Nicola Morgan explores the pros and cons of living in a Digital Age, from the information explosion to the growth of social media. Opening with a brief history of the web, she then looks at hot topics like online privacy and security, drawing on fascinating, cutting-edge research into how the internet affects our mood and sleep patterns. With cheerful illustrations throughout, this is a book for families to share: a way for teenagers, their parents and carers to inform themselves about the many advantages and risks of life online.